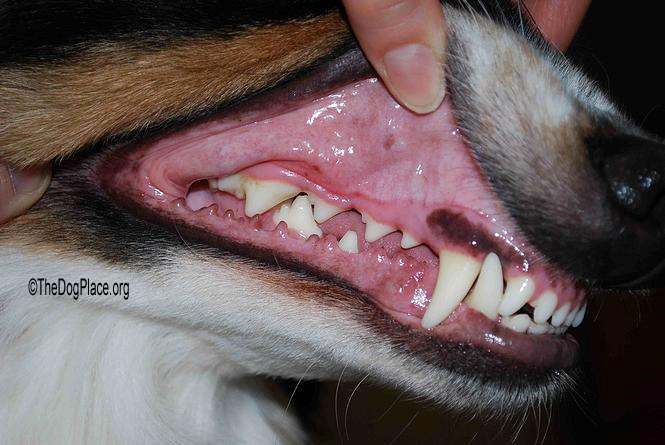 Share this with your dog club members or any friend who may be going under anesthesia. Know how to prevent or deal with memory problems - before you forget you have them. Does your pet (or parent) seem forgetful, literally absent minded, distracted, confused, even disobedient or unable to concentrate on training after major surgery? Go behind the secret surgical curtain! Forgetfulness is a normal part of aging in all species. Does your cat or dog get “lost” in the corner of a room or does he forget where the litter box or doggie door is? Does he sleep a lot more? Is it normal aging or has he been under anesthesia for an injury, tooth cleaning, etc.? A subscriber alerted our staff when she asked "What is the protocol for documenting vitals during surgery?" I'm convinced my dog has dementia from dental surgery but my vet is not about to tell me." We quickly discovered there are no specific veterinary regulations state-to-state but I was astounded to discover in veterinarypracticenews.com "... most deaths occur after, not during surgery" and this, "50 percent of canine and 60 percent of feline deaths occur in the post-op period." What? 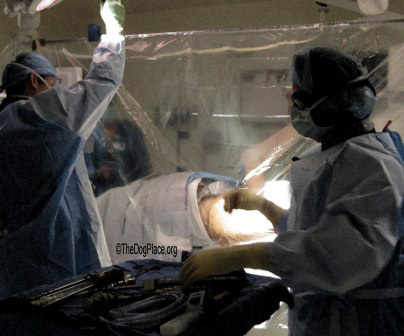 More pets die after surgery than during the operation? Does that indicate such brain function impairment that the heart, lungs, and other vital organs do not receive adequate life-preserving signals? I decided to dig deeper. And in fact, I had to dig (!) because anesthesia-induced memory loss is pretty well concealed by the medical and veterinary community. Understandable, the purpose of anesthesia is to block pain signaling but not all surgeries are life saving so you should have all the facts before deciding on elective surgery for yourself or your pet. From University of Toronto's Faculty of Medicine and other extremely credible medical sites we discovered that "permanent partial memory loss and/or inability to remember and perform simple tasks post-surgery is a condition often blamed on Alzheimer's disease." I found this section "Memory loss, thinking problems after surgery" in the UNF site. According to the University Of Florida, post-surgery decline in brain function is characterized by subtle changes in memory, in the ability to learn new information and/or to do two or more things at the same time while ignoring distractions. The 2014 study was based on statistical medical data showing "about 40 percent of older adults experience such difficulties immediately following major surgery and 14 percent of patients continue to have problems even three months later." The prevailing position is that "experts don’t know" what causes memory loss. Of course they do and thankfully, anyone who has undergone surgery remembers that they can't recall anything! The anesthesia block the pain signals a fully functioning brain would receive and obviously, it blocks all memory of the surgery and that is a good thing but it should not affect the fully awake and completely recovered brain cells. One medical source stated "The staggering loss of cognitive function and short term memory" statistics are believed to be much higher than 40%. But most information I uncovered seemed deliberately indecipherable. The UNF study was fairly open, calling anesthesia-induced memory loss "postoperative cognitive changes" and states it may be linked to "the length of the procedure and type and amount of anesthesia administered." That made sense but most veterinary colleges and websites were remiss in providing good information on anesthesia-induced memory loss. Memory loss is harder to document in an animal but here's my summation. Post-anesthesia decline in brain function may cause your dog to temporarily forget house-training, regular family routines, obedience or trick training commands and to appear genuinely confused over simple things such as where he/she sleeps. In both pets and people, more severe brain damage is characterized by an inability to learn new information or to do two or more things and as in show or obedience training, the normal ability to ignore distractions is compromised. Anesthesia damage can also change personality and behavior patterns. One of the best current sites on anesthesia and dementia is anesthesiaweb.org which states "These changes are sometimes severe enough to alter the personality of the affected person, or to interfere with their ability to perform normal activities." There is an inordinate lack of information relating to the effects of anesthesia on pets. Certainly a person facing surgery under anesthesia already has concerns or they wouldn't be searching for loss-of-memory risk factors. The scientificamerican.com blurb is typical in that it treats damage to the human brain and loss of cognitive function rather lightly, characterizing it as "Anesthesia may have lingering side effects on the brain, even years after an operation" but this jumped off the page "... confusion and memory loss that sometimes follows anesthesia. ... in turn unmask an underlying brain defect or the early stages of dementia..." Is that meant to suggest we should be grateful for anesthesia having diagnosed early dementia? Maybe so. In 2014 sciencedaily.com published a report which states in part "Anesthetics activate memory-loss receptors in the brain..." and this tidbit, "Animal studies showed this chain reaction has long-term effects on the performance of memory-related tasks." Okay, so both humans and animals can suffer long-term memory loss but let's look at what cognitive dysfunction means to you and your continued good relationship with your dog. Even more important than recognizing and forgiving "disobedience" or unusual behavior patterns is prevention! What can you do to prevent or reduce anesthesia-related memory loss? You've already taken the first step. You are reading this. People are catching on today whereas in 2011, the National Institute Of Health NIH reports that Google yielded only 764,000 searches for “anesthesia memory loss” and of those, only 3 of the top 50 hits were from peer-reviewed journals. Disgraceful! The medical community knew and veterinarians had to be aware of the anesthesia risk as regards memory and cognitive function. But it took the internet to force public reports on the association between general anesthesia and memory loss. In 2012 the NIH published Memory Loss, Alzheimer’s Disease and General Anesthesia: A Preoperative Concern and today, in mid-2015, more people are demanding disclosure on anesthesia-related memory loss. Vitamin and supplement sites tout everything from vitamin B "cocktails" to colonic cleansing but our researchers wanted to give you solid, useful information so we all pitched in and this is what we found most helpful. Vitamin "B" was high on our list even though there isn't any definitive information linking it to cognitive problems caused by anesthesia. However, the National Academy of Sciences found that vitamins B6, B12, and folic acid may help slow the progression of the Alzheimer's Disease. Unless and until there is more research done on the long-term effects to the brain which can occur under general anesthesia, we say make sure you and your pets get abundant "B" complex from natural sources in your diet and we cover that under dietary recommendations. From Andrew Weil, MD we learned that ginkgo biloba, an herb which can enhance memory by increasing circulation to the brain, may help prior to and after surgery. The recommendation is 120 mg daily in divided doses with food. Dr. Dharma Singh Khalsa, medical director and president of the Alzheimer's Prevention Foundation in Tucson recommends 200 mg a day of phosphatidylserine (PS) to augment the effect of ginkgo. PS may have a blood-thinning effect, so use it with caution if you or your pets are on Coumadin or any similar anticoagulant drugs. Assimilated from several medical sites is the repeated recommendation of pure cinnamon for prevention of Alzheimer's and numerous comparisons between the brain degeneration caused by Alzheimer's and cognitive problems associated with anesthesia. Do dogs like cinnamon? Yes, they find it palatable when sprinkled on their food. Turmeric is a tasty spice also recommended for detoxing the system so you can try adding it to the diet. Milk thistle protects the liver which is what rids the body of toxins associated with anesthetics administered during surgery. Milk thistle also prevents the depletion of glutathione, a potent antioxidant. Milk thistle is safe for dogs and is frequently used to treat diabetes, liver failure, and IBD. It is also useful for dogs that are on phenobarbitol to prevent epileptic seizures as the phenobarb can be toxic to the liver. Milk thistle can be purchased in powder form and it is best to begin use at least a week before surgery and continue for at least two weeks afterward. Dietary recommendations before and after surgery. While you or your dog recovers from anesthesia, steer clear of saturated fats, including meat and dairy (whey protein powder is a good protein alternative) any refined sugar (you'd be surprised what is in dog food!). Both can slow or block the flow of liver bile making it harder for the body to eliminate fat-soluble toxins like anesthetics. Like milk thistle, water-soluble fiber such as oat bran, apples, beets, and carrots contain compounds that aid in detoxification. 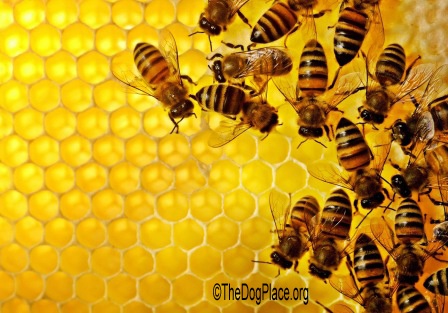 Your dog should readily accept them when mixed with his regular meat diet. There are also herbs and spices that will help you detox and recover from anesthesia—especially the antioxidants turmeric and cinnamon. In addition, include foods that are rich in sulfur, which helps the liver clear toxins. Tasty sulfur-rich foods include garlic, onions and egg yolks. Your dog will love them! 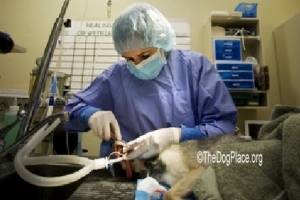 TheDogPlace.org staff hopes that you will not need this information but "just in case" you, a family member (your dog) should face surgery, remember where this is. Request reprint PDF (below) or save it to your favorite places. We also invite you to share it with your dog club members or any friend who may be going under anesthesia. It is better to be concerned and know how to prevent or deal with memory problems than to forget that you have them! It can kill bacteria, viruses, shrink tumors, and help brain function. Nausea, bruising, healing, staph infections. Safe, simple remedies. Take time to explore risk vs. benefit on every elective surgery.